I am not an electrician, an HVAC specialist, a trained Nest consultant or frankly anyone you should trust. I provide this information solely as a reference implementation and provide no warranty that it's accurate or even safe. You should consult an electrician or specialist before doing anything you read here. Incorrect wiring can cause massive damage to your HVAC system, or even result in fire. 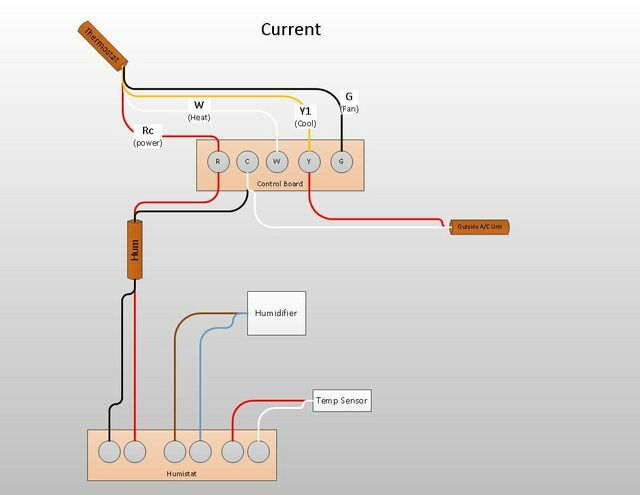 In determining how to wire things up, I relied on advise from the good folks at The Thermostat Forums, and you can also look to the DIY StackExchange site. A “Humidistat” is the thermostat equivalent for a whole-home humidifier. It generally has an external sensor that reads the current humidity levels of the outside air, as well as a built-in sensor for the inside air. When the humidity inside is too low, such as in the winter when the heater is drying out the air, it will evaporate water into the hot air leaving the furnace and into the house. Now, connecting the Nest to the humidifier was not a straight-forward process. Humidistats come in two types, which basically comes down to 1-wire or 2-wire controls. If yours only uses 1 wire, good news, you can easily and quickly hook it up to the Nest. But most utilize 2 wires, much like a light switch, where a low voltage signal travels up one wire, the humidistat acts as a switch, closing the circuit for the voltage to travel down the second wire back to the humidifier to signal it should turn on. So in order to use the Nest, which only has 1 wire to control the humidifier, you must install a relay circuit, which, if done wrong, can damage your HVAC main board, your Nest and your humidifier — so Nest asks that you have a professional do the work. However, I am comfortable doing that kind of wiring and was able to install the relay and get the Nest hooked up on my own. I used a 6AZU2 relay, which seems to be a commonly used relay for people doing exactly this (see the comments on the Amazon page). I used crimp-on spade connectors on the end of the wires to connect them to the relay terminals. 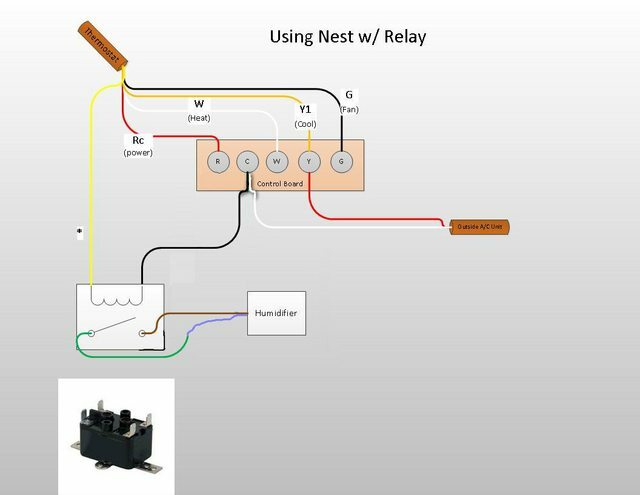 So when the Nest sends the signal on the "*" wire, the relay closes the circuit between the two lines on the humidifier, engaging it.